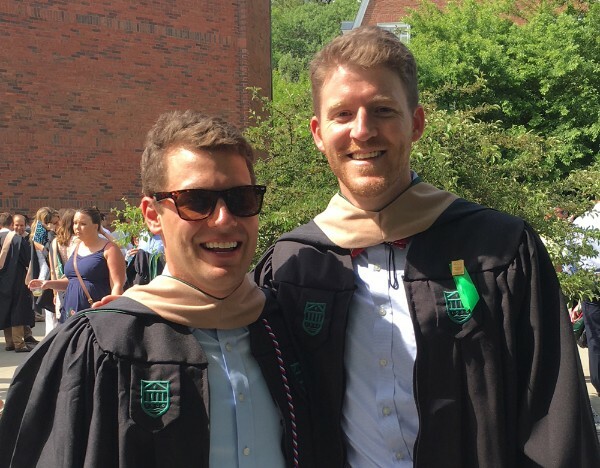 Sean Graber and Keal Harter are 2018 Tuck graduates and cofounders of the skeww (@theskeww). Find their full bios at the bottom of the page. Tell us about the skeww. What led you to start it and where do you see it going? the skeww is the go-to place to see opinions from the left and right on key issues of the day. My Tuck classmate Keal Harter and I started the skeww after spending three weeks in Europe on a consulting project. We are both very interested in politics, and we would have very spirited—but also very civil—conversations about a variety of topics. When we looked around we didn't see many of those types of conversations happening; instead, we saw a lot of misinformation and name-calling. We created the skeww to change that. We want to bridge the current ideological and political divide with understanding and constructive dialogue. Today, the skeww (which exists as a website, newsletter, and podcast) curates, categorizes, and summarizes political commentary by political bias, which enables our readers and listeners to quickly understand arguments from both sides. In the future, we are interested in expanding the content that we create and exploring new distribution channels. What are your thoughts on the state of political discourse today? How do you think the skeww will improve that discourse? Unfortunately, political discourse today is in a bad way. It seems increasingly difficult to get people to simply agree on the facts—let alone how to interpret those facts or translate them into policy. Instead, politicians and pundits often try to score political points with soundbites designed to appear on cable news or social media. The willingness to listen and the nuance have been lost. With the skeww, we present concise, but not over-simplified, summaries of arguments from the left and the right. We also link to our source articles, which are categorized on a spectrum from far left to far right, so that our readers can investigate further if they would like. We believe that this will improve discourse because it will force a reader from the left, for example, to engage with the arguments from the right. Maybe that reader will change his mind, or maybe he will become more convinced of his view. In either case, as long as he is better informed, we have done our job. Tell us about the business side of the skeww. What was the biggest challenge you faced getting started. Is there anything you would do differently? Initially, the biggest challenge that we faced was technological. Neither Keal nor I has a technical background, so we had to teach ourselves to develop the website's backend (which collects and analyzes news articles) and the front end. Now that we have a basic version of the skeww, we're focusing on identifying and reaching our audience. There are many companies competing for people's attention, but we believe that we have a unique product that will save people time and make them better informed. Would you say the skeww aims to promote a free market of ideas? In what ways is this similar to free market economics? In what ways is it different? the skeww is absolutely dedicated to promoting a free market of ideas. As a company, we do not advocate one side or another; instead, we select and present the best arguments from the left and right so that our readers and listeners can decide what they find most convincing. This is extremely similar to the free market in economics in which a group of rational actors can vote with their wallets and select the best companies or products. Perhaps the only difference is that ideas are not "scarce." As many people can hold as many views from the left or right as they want; the only cost may be that they have to subscribe to our newsletter! Sean Graber is a recent graduate of the Tuck School of Business at Dartmouth. While at Tuck, Sean interned as a Product Manager for TripAdvisor, the world's largest travel site, where he helped design products used by millions of users around the world. 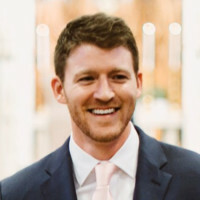 Prior to Tuck, Sean founded an international leadership development company and worked as a management consultant in Deloitte Consulting's Strategy & Operations practice. In addition to his Tuck MBA, Sean has an M.A. in economics from the University of Valencia in Valencia, Spain and a B.A. with Distinction in History from the University of Virginia. In his spare time, Sean enjoys reading about U.S. history and hiking with his wife and Vizslas in the mountains of New Hampshire. 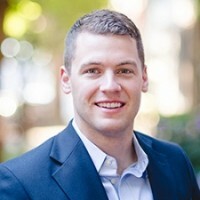 Keal Harter is a recent graduate of the Tuck School of Business at Dartmouth. While at Tuck, Keal interned as a Product Manager for X-Rite Pantone, a Danaher company, where he helped reintroduce one of X-Rite's most successful products. Prior to Tuck, Keal was an officer in the Navy for six years. In addition to his Tuck MBA, Keal has an M.Sc. in International Relations from the London School of Economics and a B.A. with Distinction in Political Science from the University of Michigan. When not talking politics, Keal enjoys sailing on Lake Michigan and improving his casting for his newfound passion for fly fishing.